Julia Child: Beloved Icon, Role Model...Homophobe? As Laura Shapiro explained in a biography, excerpted in Boston Magazine, Julia was a woman who defined her life by her close marriage to her husband, Paul, and considered their married state the height of happiness. For this reason, she found homosexuality outlandish-not immoral, and certainly not to be criminalized, but a rude disruption in the natural order of things. Homophobia was a socially acceptable form of bigotry in midcentury America, and Julia and Paul participated without shame for many years. She often used the term pedal or pedalo-French slang for a homosexual-draping it with condescension, pity, and disapproval. "I had my hair permanented at E. Arden's, using the same pedalo I had before (I wish all the men in OUR profession in the USA were not pedals! ),"that little bunch of Pansies," a cooking school was "a nest of homovipers." She was also known to toss the term "fag" around in private, and later, notoriously, blocked the appointment of a gay chef at the the American Institute for Wine and Food. Julia Child adored men, but "masculine" men, whose company she adored and who she felt, French-fashion, were natural masters of the kitchen whose involvement should be encouraged in order to further distance cuisine from drudgery. ( Of lesbians, she apparently said,"Can't be much fun.") While, as we know, this form of casual prejudice was hardly unusual in the era - and not even always as malicious as it might seem - in Julia Child's case the situation's complicated by the fact that, unlike many of her era, she'd actually had a lot of experience and contact with uncloseted gay men. Even in the 60s, there were a number of chefs whom everyone knew to be gay, and Julia enjoyed a close and enduring friendship with James Beard. With the exception of the Wine and Food case, though, Child seems to have been able to put her personal feelings aside: her main concern, apparently, was talent, and she'd generously support young talent wherever she found it, helping people of all orientations. By the end, she'd apparently changed her tune. By the 1980s, when the AIDS crisis began to unfold, the horror of what was happening to people she knew, and people she loved, dealt a significant blow to her longtime prejudice. "Last year my husband and I stood by helplessly while a dear and beloved friend went through months of slow and frightening agony," she told a crowd at the Boston Garden in 1988 during an AIDS benefit sponsored by the American Institute of Wine and Food. "But what of those lonely ones? The ones with no friends or family to ease the slow pain of dying? Those are the people we're concerned about this evening. And food is of very special importance here. Good food is also love." That is the Julia we want to remember. To those of us who love Julia's forthrightness and idiosyncrasy, hearing about the ugliness of prejudice is difficult. Yes, her views were not unusual for the times, but we love her for her independence and departure from convention. And as stated, this was not the vague general prejudice of total ignorance, but a distaste directed at specific individuals. No one is perfect, of course: Flannery O'Connor, in many ways progressive, had many of the attitudes of a typical 1950s white southerner. 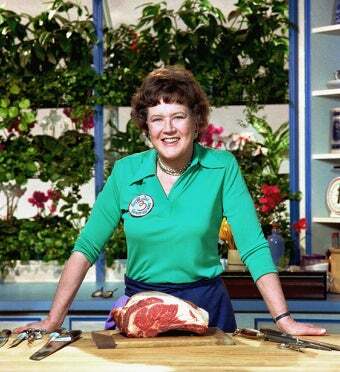 Similarly, had Julia Child lived later, who knows what her views and attitudes might have been? But had she lived later, she couldn't have been the force for change that she was. It's unrealistic to expect modern sensitivity in retro idols, and I know that. But part of an idol's job is to reflect what we want to see and live idealized, and in some ways it would be an insult to their memory not to be disappointed. Does this tarnish Julia's legacy? Perhaps. But the ability to change isn't a bad one, either.